DIVA CHAT Tamron Hall on Running Wild! What do you get when you drop six celebrities in the wilderness with just a compass and an extreme survivalist? We’ll find out when Running Wild with Bear Grylls returns to NBC tonight! Of these six brave personalities, which includes Zac Efron, Ben Stiller, Channing Tatum, NFL Hall of Famer Deion Sanders and Tom Arnold, people may be most surprised to see MSNBC and Today anchor Tamron Hall taking on tonight’s 48-hour challenge. Angela Yvonne chatted with Tamron, the first African-American woman to co-host the Today show, to find out what made her want to face this challenge, what she learned and what was the hardest thing between her journey to Today and running wild with Bear. You have accomplished so much as an African-American woman. What made you want to do this challenge? I have never done anything like it. I remember going to church camp and staying less than twelve hours. I had never slept outside, and I was a Brownie for a week, I just was not that child (Laughs). It was an incredible experience, especially with Bear who really has an appreciation for what he does. The challenge was real, and I probably would not have done it if it was not for him. What can you say that you learned about yourself? I learned to eliminate the word “fear” from my vocabulary. You have to have a mental toughness in the business I am in. It taught me to transfer that to other things and be just as tough. Now would I advise you to come camping with me, and you’ll be ok (laughs). I can build a fire though. I hope that I changed the perception of me just being a glamour girl whose favorite word is Louboutins. It really reminded me of my 20-year-old self who just experience things and lived. Which was harder: the journey to Today or being out with Bear? That is a great question! I have to say being with Bear, there was a moment where I could have died. A boulder had come loose and started to come towards me and Bear had a look like “OMG, are you ok?” I definitely will say Bear. Tune in to Running Wild with Bear Grylls Monday, Sept. 1 at 8 p.m. on NBC. ABC TV Press Tour ’18: Tamron Hall Joins The Happiest Place On Earth! DIVA DISH! Tamron Hall’s New Talk Show… And Baby! Luke Perry R.I.P. 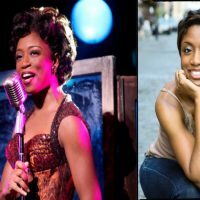 DIVA CHAT Broadway Beauty Montego Glover Drops Her Beauty Secrets!